On a day like today, a beautiful June afternoon, you simply MUST get outside and enjoy the fresh warm air and sun before it gets so hot and humid that you feel like a big dog is breathing down your back. The dog days of summer are coming but today was pretty perfect really. 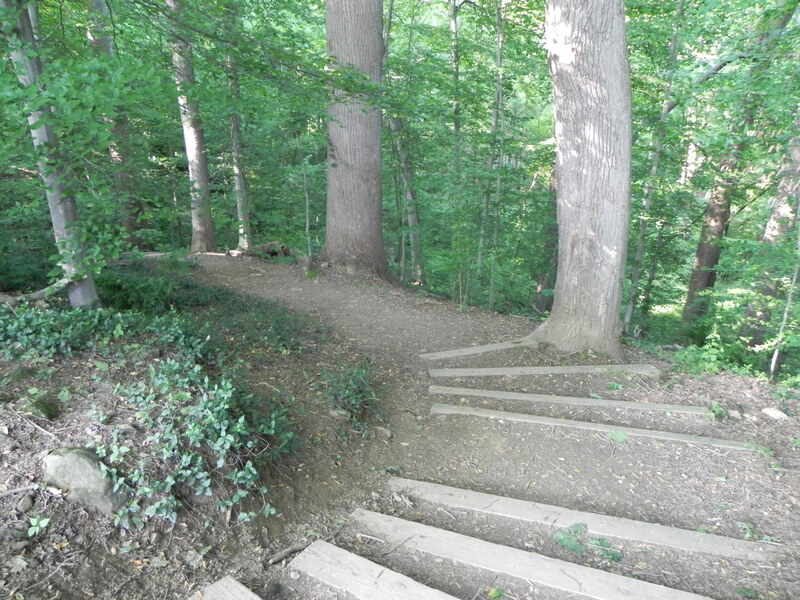 One of the parks we enjoy most on a day like this is Cabin John Park at 7401 MacArthur Blvd. This 6-acre park is a short drive from downtown Bethesda and offers a nice blend of facilities for ball games of all kinds – basketball, softball and of course, tennis. For the little people, there is a little playground and grassy area with a couple of picnic tables too. That’s where we enjoyed our sushi picnic last week. Parking is usually readily available here and it’s a great place to just lay out and relax or challenge your best bud to a tennis match before it’s just too darn hot this year. There are some nice ball fields here as well but I must warn you not to bring your band of brothers out here to play without booking the field in advance. The reservation/permit process is easy and it will save you the disappointment of losing out to some other baseball or softball bunch who was smarter than you and planned ahead. To book the ball field, first open a ParkPASS account (click here for step-by-step instructions) at www.parkpass.org. Then you’ll be able to go to the Montgomery County website and reserve your facility of choice at any of our local County Parks for a few bucks. Day 141: Care for a Sushi Picnic? Today was truly a wonderful spring day in Bethesda – the perfect temperature, not too humid, sunny but not too hot and a slight breeze – ideal for a picnic! 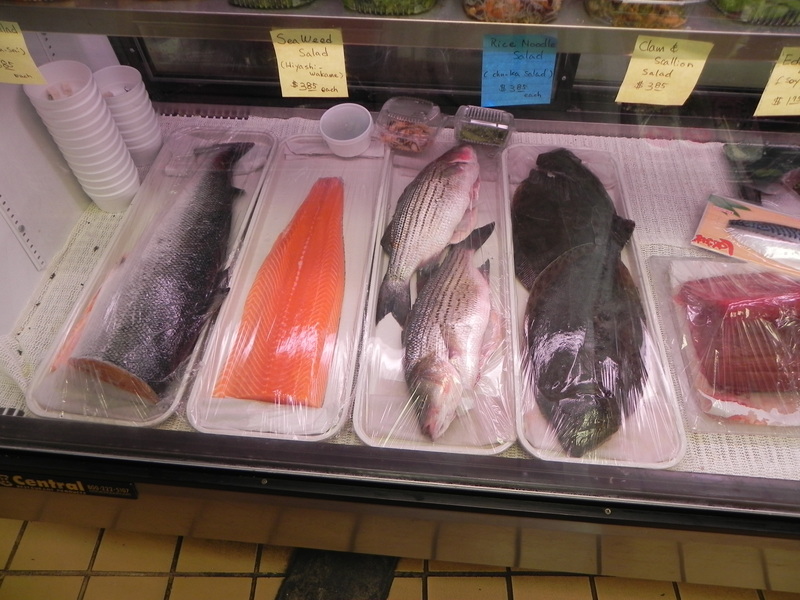 Brian and I were in the mood for fish though – not your normal picnic fare. So how can you seriously enjoy fish and a picnic? Kanpai Sushi at 7307 MacArthur Blvd in Glen Echo is your answer. Since 1985 Kanpai Sushi has been serving its loyal customers who thoroughly enjoy their fresh and beautiful creations. We popped in today at the recommendation of a client we met recently who happened upon the place and shared their excitement with us about their visit. I had never noticed the place because it is a small and obscure little shop. The nicest men were working and happily took our sushi order while busily making rolls and nigiri for their customers. Our order included two spicy tuna hand-rolls (one of my favorite sushi delights) as well as salmon nigiri, tuna nigiri and a California roll with fresh crab. Of course our snack was accompanied by wasabi, ginger and little containers of soy sauce to go. 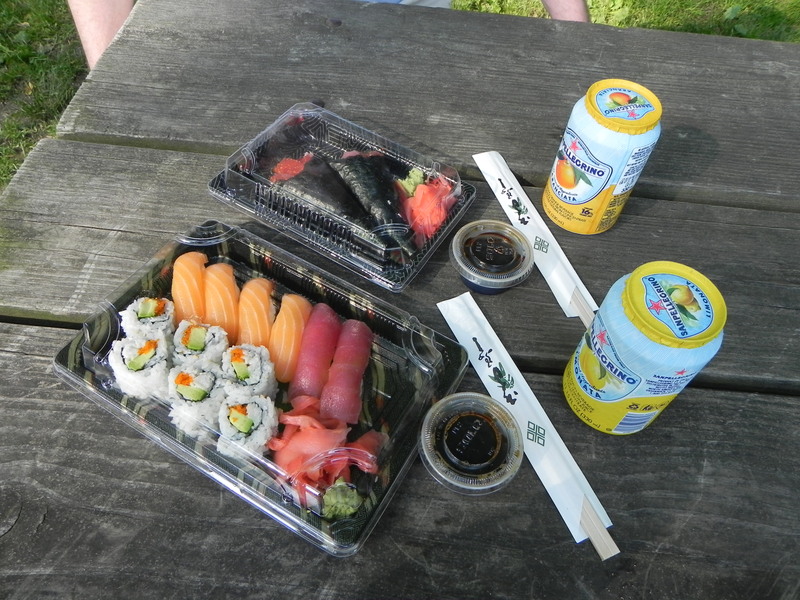 We added some San Pellegrino and off we went to Cabin John Park to enjoy our sushi picnic! We were not sure what to expect from this small little sushi shop in Glen Echo but we were truly delighted with the mouth-watering creations made by our sushi masters. That spicy tuna hand-roll was true to its name and was one of the spiciest ever! I was very glad for the San Pellegrino! Brian and I will definitely be back for more sushi take out…soon! Day 115: Miniature Train Ride! Now that the weather is once again pleasant it’s time to head outside. 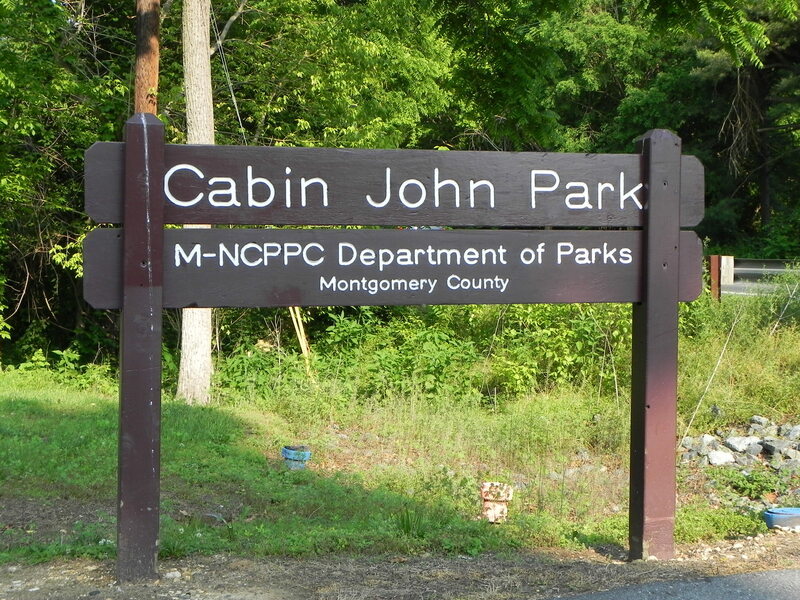 We like to head to Cabin John Regional Park. The park is located on Tuckerman Lane not too far from Cabin John Shopping center. One of my boys favorite things to do here is ride the miniature train. The train is a scaled replica of a steam locomotive from the mid 1800’s. The train makes a large loop through Cabin John Park under a canopy of mature trees. After leaving the station the kids seem to enjoy the periodic steam whistle the conductor blows as we pickup speed. It’s a great break after running around and playing on the play equipment at the park. The train is closed from November through March but just reopened for weekends only in April and May (Sat/Sun 10 a.m. to 5:30 p.m.). From June through August the train runs seven days per week (Mon.-Thu. 10 a.m. to 5:30 p.m. and Fri.-Sun. 10 a.m. to 7 p.m.). Tickets are $1.75 each. Wanna have a really cool birthday party? Consider hosting it at the Train Station Party Room that features a train motif and a room that can accommodate up to 50 guests! The cost is $100-$175 for a 2 hour time slot. Call 301-650-2880 to reserve the room. The kids also enjoy two of the interesting features near the “Train Station.” The first is a water fountain inside a large hippo’s mouth. I’m not sure the kids would be so eager to be in this position if they knew that Hippos can run faster than humans on land and are considered the most aggressive and dangerous animal on the continent of Africa! They also like to put trash in the “Porky Litter Eater.” Porky is really a trash collection building reminiscent of the brick structure from the children’s story “The Three Little Pigs.” A somewhat creepy voice encourages the children to place items that can be recycled inside the pigs mouth!